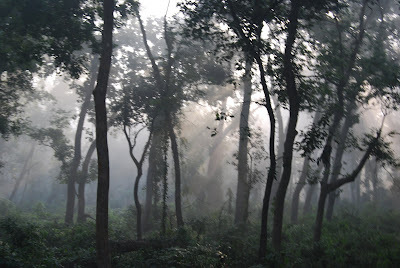 We readily agreed when Chandan, one of the friends invited us to Dudhwa Tiger Reserve Forest. Another friend Agni and his parents also got excited at the idea. 5 of us from Delhi started our advanture trip. We decided to drive down. We took NH 24 and crossed Ghaziabad, Hapur, Muradabad, Bareilly, Shahjahanpur, Sitapur, Lakhimpur and Palia. Met Chandan and 2 of his colleagues at Lakhimpur. The group of 8, comprising of members as young as 20 and as old as 60, was all game for adventure. After Palia, we found ourselves at the entrance of an unusual bridge. This was a bridge which was also shared by trains. Yeah! you read it correctly. You drive over the track and if there is an oncoming train, well you wait and give the way. I didn’t see any other bridge on the side and it seemed like the only way to go to Dudhwa Tiger Reserve over times. 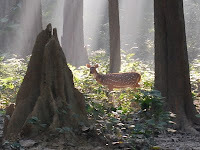 The accommodation was arranged at Forest rest house Dudhwa located within the core forest area. Its location, beautiful huts, cosy bedding and warm staff made it a good place to stay. Day 1 was spent getting to know the place and the people - Spoke with guides; Browsed through the brochures, pictures and other information material available; Met members from Wildlife Trust of India and Roamed around in the nearby forest area. Successful rehabilitation of Rhinos, Fire line maintenance, Swamp Deers thriving here and Hispid Hares sighted recently are some other interesting pieces of information we gathered. The tall Saal trees giving shelter to thousands of birds... even the sunlight is shy to fall on virgin land. I was mesmerized by the sight, sound and scent of fresh morning. 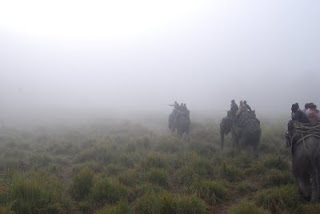 We headed towards Sonaripur at 7 in the morning for the Elephant safari with guide Baddal. We reached a bit early. Elephants were getting ready to take us on a ride. 4 - 5 people per elephant and 4 elephants in all. Up and down... here goes the Elegant Elephant wondering in the midows on narrow paths and at times no path at all. The most common sight was Spotted Deers playing around in their natural surrounding. Felt like you are in a fantasy land. "Look there" Baddal whispered. It was a mother Rhino with her son. What a sight it was! 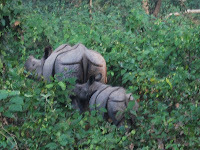 First they were facing us, as soon as they noticed us they turned their back towards us thinking even we can not see them. Spent some more time wondering around experiencing wildlife. After basking a bit in the Sun and having Lunch we headed again towards the jungle at around 3PM. This time we were on our own vehicle with guide Chandar. It was 3PM and yet inside the dense jungle it was almost dark. Sun light was trickling in through the leaves at some places. We sighted good variety of Birds including Kingfisher, White breasted Bulbul and many more from "Machaan" while the guide kept telling us stories of the place, one of many was about Dr S D Singh being attacked by Tiger and a road and a watch tower named after his name. And suddenly he asked us to stop the car...!!! 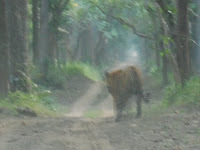 The King of the jungle Royal Bengal Tiger with it's majestic beauty and unparalleled grace was lying down on the path at about 50 yards in front of us! My body became numb, breathing accelerated and heart started pounding. We kept observing Him quietly from distance. We enjoyed the sight for more than 20 min and then moved little ahead on the track to have a closer look. And then He moved... I could feel that trance of fear in the air. The King got up, moved and started scratching the tree trunks. He was marking His territory I guess. Another 15 min and He crossed the path and moved to the other side. It was the time for us to leave Him alone. Back in the Rest house when we narrated our experience and shared the videos and pics, people couldn't believe. It is the first time they have heard that someone has actually sighted and observed a Tiger for that long. Lucky we!!! Every second a drama is unfolded unknown and undisclosed to the other…a little sound of dry leaves and you will be shivered to see a full grown python slipping away to the muddy water... a look beyond will freeze your blood by the sight of a full grown alligator resting motionless on the bank of river! We were told to go via Pilibhit, a small village, to avoid the traffic at Shahjahanpur. Enjoyed the drive back with lots of leg pulling, singing and eating. Too much adventure, Shailza ji. I am so jealous. I need to take one of these trips, love the way you describe everything. What an experience it would have been to see the King from such close quarters. For now I will have to be content with seeing this trip from your post, which by the way is awesome! Bhabhie no doubt its a nice place and as usual u have written it beautifully..but the roads in the jungle r not good as u cant take a U TURN..In fact there is no U Turn also and full of elephant dung..One can find tiger in palampur also ( bhaiya se pucho ) not a big deal..By the way bhabhie we saw a tiger i believe and not a lion.Lion toh nahi dekha tha na..One thing i learnt from next time we should carry helmets also..Some people need it or else the top roof of the car will have to bear the damage..Anyways thanx to bhaiya for arranging such an adventourous trip..
love the pics and the documentary. amazing experience .. 'thumbs-up' for the great trip .. the pics as usual are amazing.